Pituitary Gland, Pars distalis - Atrophy in a female F344/N rat from a chronic study. 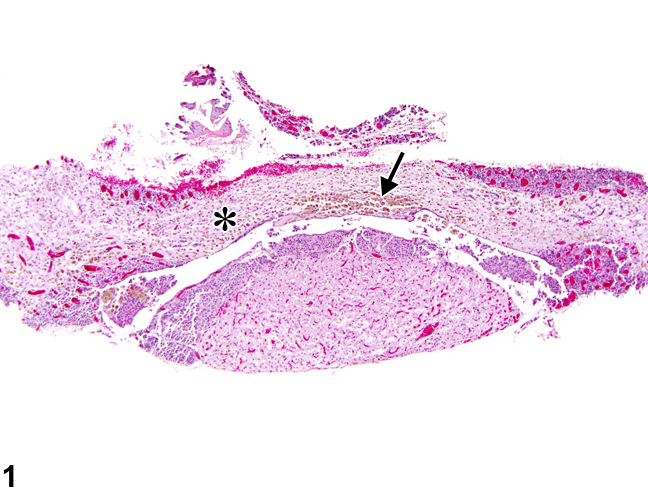 The pars distalis (asterisk) is reduced in size and contains a focal aggregate of yellow-brown pigment (likely hemosiderin) within macrophages (arrow). 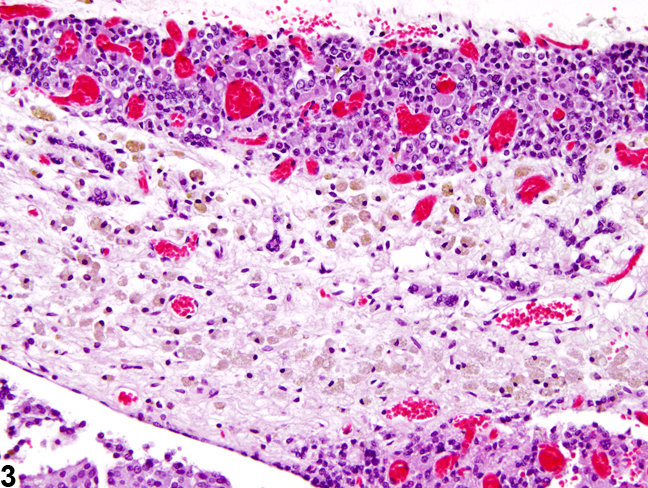 Pituitary Gland, Pars distalis - Atrophy in a female F344/N rat from a chronic study. 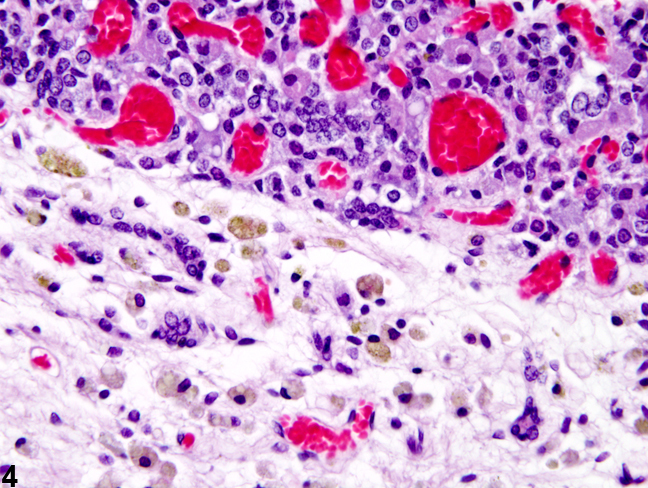 Higher magnification of Figure 1 shows the reduction in the size of the pars distalis (asterisk) and the focal aggregate of macrophages (arrow) containing yellow-brown pigment (likely hemosiderin). Pituitary Gland, Pars distalis - Atrophy in a female F344/N rat from a chronic study. 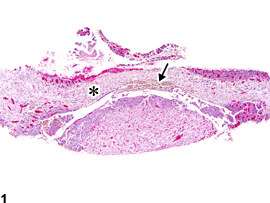 Higher magnification of Figure 2 shows that the atrophic pars distalis has a paucity of cells and that macrophages containing yellow-brown pigment (likely hemosiderin) are present in the atrophic tissue. Pituitary Gland, Pars distalis - Atrophy in a female F344/N rat from a chronic study. 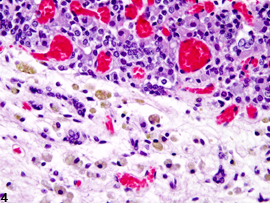 Higher magnification of Figure 3 shows the atrophic pars distalis with the pigment laden macrophages in greater detail. Atrophy of the pars distalis can occur as a sequela of necrosis secondary to ischemia and/or from compression on the pituitary by a space occupying mass. The latter is more common. Yellow-brown pigment (hemosiderin) may be present within macrophages in the atrophic tissue ( Figure 1 , Figure 2 , Figure 3 , and Figure 4 ). Small portions of the pars distalis may be spared. In contrast, interruption of hypophyseal nerve fibers would likely result in atrophy of the posterior lobe of the pituitary. Atrophy is most common in the pars distalis but may also affect the pars intermedia and the pars nervosa. Atrophy of the pituitary should be diagnosed and graded whenever present. The area affected should be included in the diagnosis as a site modifier (e.g., Pituitary, Pars distalis - Atrophy). If more than one area is affected, the site modifier may be omitted and the affected sites noted in the pathology narrative. 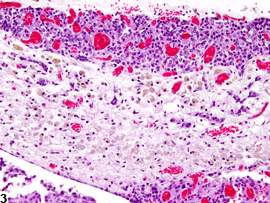 The pathology narrative can also describe the morphologic features (including the presence of pigment laden macrophages) and extent of the change. Daniel PM, Prichard MM. 1956. Anterior pituitary necrosis; infarction of the pars distalis produced experimentally in the rat. Q J Exp Physiol Cogn Med Sci 41:215-229.